Please use only barbless hooks. Our brief is to give the visiting fly fishermen everything they dream about when they think of the pinnacle of their sport. We often achieve our aims in spectacular fashion, when those who are prepared to watch, fish and enjoy, tell us they have enjoyed their day or season like no other. But for every action there is an equal and opposite reaction and we must make it equally unpleasant for the intruders, interlopers and aliens. This has to be the ultimate in ethical trading; where anglers pay to enjoy their day for a return of water voles, otters and the kingfishers; created from the shoals of sparkling grayling or the abundance of wild trout. When you pick the fly out of its keeper and cast to the rising wild trout or grayling on Haddon’s rivers you will know you are supporting a business that has done its utmost to protect and support the native animals and plants of the river corridor, often in ways that are unseen and unknown. Be assured that you are the benefactor to it all. Thank you. Soon after dawn on 5th June 2003 we stocked our last trout into the rivers under our control. Sadly the significance of the moment passed us by because it wasn’t until the autumn of that year that we put into action a plan to stop all introductions of farmed fish, immaterial of size or strain. 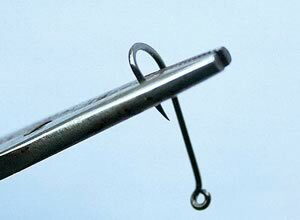 It is the very height of bad manners to stock under the noses of anglers so our journey down the river bank in the landrover, pulling a trailer full of farmed trout, had to be performed in the half light while even our keenest customers still snoozed. Our fish were the very best: regularly graded, fin perfect and peas in pods at 2lbs each. These brown trout were the product of stripped wild fish, caught running the weirs in their upstream migration to spawn. Unfortunately we found they were having a negative impact and along with angler bag limits of four fish, the wild trout populations were really down at heel. 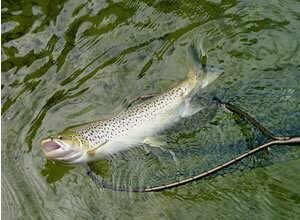 During the summer of 2002 we searched for just one true example of the wild brown trout of the Wye but soon after it was found, sitting tight under a bank side alder coppice, it was caught and killed. Something had to be done. In 2006 we were joint winners at the Wild Trout Awards for Conservation, along with those like minded people on the Monnow. In summing up our achievements Dr David Bellamy described our project as ‘radical, with some financial risk’. He was right; although we researched the project very carefully it was believed by some that we were moving too fast for our customers. Were they willing to put their catch back alive? Would the first few years of transition cause our regulars to go elsewhere? Two things happened. Firstly we were supported by our customers from the off and secondly the rivers responded in a way that still astounds me as I write, over 6 ½ years later. Without the annual burden of 2,000 stock browns, our native fish have flourished. In one short survey section of a tributary, which previously only held a few stock fish, the wild trout numbers grew to 66 in just two years. We do not stock. We don’t put eggs in boxes, fry in back eddies, fingerlings in runs, adult trout – anywhere - nor ex-brood fish to sandbag your rod. You will not be told ‘we dribble a few in from time to time to freshen things up’. We don’t feed pellets to the river, so when you play your fish, others won’t think it must be feeding time and come swirling around your feet. We don’t move monsters from their home under bridges to open water; we don’t interfere. Our fisheries team do their utmost to protect the wild trout and grayling of the Wye and because we know you also enjoy kingfishers, osprey, barn owls, otters and water voles -we look after these too. We are challenged by interlopers and aliens to the watershed. Those cormorants and mink would empty the rivers, the sickly sweet smell of the Himalayan balsam wants to get everywhere and huge hogweed and thick stands of knotweed would block your way. Our defence is made with the gun, the trap and the strimmer. Your part of the bargain is dry fly only, catch and release and no wading.